Friday Night Lights and Family Guy are first-time Emmy finalists. NBC's made-in-Austin Friday Night Lights and Fox's made-overseas Family Guy are among Emmy's official contenders in drama and comedy. That doesn't mean that either will be nominated, though. Hoping to spark a little more publicity and viewer interest, the Academy of Television Arts & Sciences for the first time has released a list of 10 series finalists in its two major categories. Those lists will be cut in half when the official nominations are announced on July 17th. Friday Night Lights recently won a Peabody Award, which might help its chances. 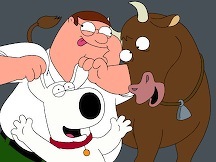 Family Guy was entered for the first time in the comedy category after previously joining the animated series contenders. Notable omissions in drama include NBC's Heroes, TNT's The Closer and any of the CSI or Law & Order series, respectively the properties of CBS and NBC. Note: It's hard to leave Dexter out, but The Wire has never been nominated and at least deserves that accolade in its final season. Note: Were either in the mix, I'd pick Fox's The Simpsons or King of the Hill over Family Guy. And Weeds is omitted because last season hit a low point, not a high. Sept. 18 -- The 17th edition of Survivor, this one originating from Gabon.